AutoTrac Vision becomes the solution to experience all benefits of AutoTrac in application operations in corn, soybeans, and cotton, utilizing a monocular camera to detect the crop rows and guide the vehicle down straight rows. Operators will benefit from reduced fatigue, less crop damage, and higher speeds when compared to manual driving. Following a row in these situations can be stressful and tiring for even the most highly skilled operators. An operator focusing on the crop row to prevent damage for extended periods of time during the day can lead to fatigue and enable mistakes such as damaged crop and reduced yield. When weeds begin to emerge in the growing crop, applicators have to race against time. Palmer Amaranth or pigweed can be the most notorious because once they emerge they will be too established to effectively treat within 10 days. Palmer Amaranth is a prolific seed producer with the potential of producing nearly half a million seeds and at least 100,000 seeds when competing with a producer's crop. Therefore, getting the job done at the right time and in time is critical to reducing future weed pressures and potential yield reduction. AutoTrac Vision could allow the user to spray up to 20 percent faster in the row compared to manually driving today. Growers are working long hours and it is a crucial time to get the job done, AutoTrac Vision will enable fewer mistakes at higher operator speeds. Operators will experience some of the same benefits in a tractor, while increasing crop safety and reducing fatigue. In today’s economy, leaving any yield in the field during the growing season is unacceptable. Running over crop in post emerge application will quickly reduce a producer’s overall yield. AutoTrac Vision will give a producer an opportunity to capitalize on potential lost yield. An operator could see reduced crop damage by minimizing the instances when a lapse in attention results in significant crop damage. The chart below shows plants damaged at a variety of operating speeds and seed population. Producers work too hard to grow quality crops to afford to leave any of that yield potential in the field. However, while spraying standing corn, yield-limiting damage or losses can occur. When spraying, some operators may choose to cross crop rows to simplify spraying and reduce stress. However, this method of spraying can damage more the 2 percent of the plants in the field. To improve yields, many operators will follow crop rows to reduce this damage. In this instance, keeping the sprayer’s wheels in between the corn rows is important to ensure that plants are not damaged and can reach their full yield potential. Unfortunately, with so much going on in the sprayer cab during long days, a small lapse in attention can result in significant crop damage. For example, an operator spraying at 15 miles per hour who is misaligned with the row for 1 second could damage more than 90 corn plants. During the course of a day, a few minor misalignments could lead to major damage. With AutoTrac RowSense™, the operator can be confident that the sprayer is staying in the row, even if they cannot physically see the sprayer wheels. All operators know that not all fields are created equal. In some instances, there will be nice even, clean stands while others may have washouts, missing crop and excessive weeds pressure. In these situations, AutoTrac Vision system will fall back on the GPS to keep the vehicle in the row. With AutoTrac Vision, the camera is the first priority. When the camera does not have confidence in the row crop due to crop stand or slope in the land, it will fall back on GPS. 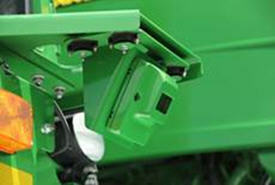 Once crop is detected and the camera has confidence in performance, it will engage AutoTrac Vision. While operating sprayers, operators have the ability to choose to operate with both sensors when applying in later-season corn (Vision and RowSense™). The system will use Vision first for priority and then fall back to RowSense if Vision confidence is lower than optimal operating range. This is called RowSense fallback. If confidence is low on AutoTrac Vision and RowSense, the system defaults to GPS using the operator’s guidance line. The operator will have the opportunity to see a live AutoTrac Vision feed on the display. This will include an overlay with informative graphics to indicate how well AutoTrac is performing and if the wheels are centered in the crop row. 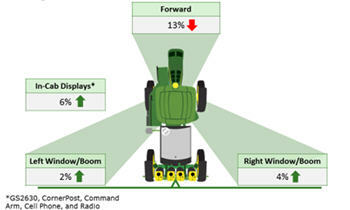 With AutoTrac Vision system, the is the first priority when it comes to guiding the machine down the row. As long as the camera detects the corn plants, it will provide the inputs to the AutoTrac system and the machine will follow the row. In other instances, where the camera is not detecting crop rows due to missing plants, the system will quickly switch to GPS-only guidance until good, stable rows are detected again. For example, crop stands following a wet spring may have uneven stands and areas where the corn was drowned out. As the machine crosses into the washed out areas, the system will detect that crop is missing and will quickly switch to GPS-only mode to guide the tractor or sprayer across the troubled area and into the correct row on the other side. Staying on the correct row maximizes efficiency in the field. GPS fusion ensures the operator follows the correct row even when conditions get tough. Additionally, appropriate wiring harnesses and brackets are needed to mount and connect components to allow AutoTrac Vision and RowSense™ to work appropriately. This is the compatible equipment approved with the software update 19-1 release, and is subject to change with newer software updates. To ensure complete and proper compatibility, the most current version of implement control unit software, Gen 4 Display software, or compatible farm management information software (FMIS) should be used. Non-current software versions will require an update before support can be provided. Unapproved software version configurations will not be supported. The software update 19-1 release is only compatible with 4600 CommandCenter™ v2 processors. Software update 17-2 is the last release that was compatible with 4600 v1 processors. *NOTE: For latest Precision Ag functionality, update machines equipped from the factory with v1 processor to v2. 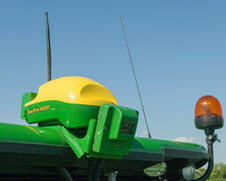 *NOTE: When using the 4640 Universal Display on a Hagie Sprayer, additional mounting and harnessing may be required. Current John Deere/Hagie field kits only offer GreenStar 3 2630 Display parts. *NOTE: If using 4640 Universal Display, AutoTrac RowSense on a 70-Series Combine is not compatible. NOTE: Competitive equipment may be compatible with 4640 Universal Display and 4240 Universal Display. For additional compatibility information, see AutoTrac Universal 200, AutoTrac Universal 300, or AutoTrac Controller in the Ag Sales Manual. SeedStar™ 4HP planters are only compatible with 4600 CommandCenter displays with a version 2 (v2) processor and 4640 Universal Displays. Displays should be running Gen 4 OS software version 10.10.404-390 or newer and the most current version of tractor applications to be compatible with SeedStar 4HP planter applications. Additionally, dual-display mode is not available for use with SeedStar 4HP planter applications, along with Gen 4 Extended Monitor. The SeedStar 2 configuration below is available only on factory-installed model year 2011 and newer planters and may be field-installed on model year 2009 and 2010 planters. Green PM/PA controllers (factory-installed on model year 2009 and 2010 planters) are not supported with a Gen 4 display. For John Deere dealers: the Service ADVISOR™ tool is needed to update SeedStar 2, SeedStar XP, and SeedStar 3 HP software. Documentation is not supported when using a rate controller to control row clutches on a John Deere planter. *NOTE: For implements requiring ground speed input (radar), utilizing a 4240 Universal Display may require an additional 4240 Radar speed kit. The C850 Air Cart requires a 4600/4200 CommandCenter Display or a 4640/4240 Universal Display. GreenStar 3 2630 monitors are not supported. Additionally, C850 Air Carts and AutoTrac Implement Guidance (passive) are compatible with software update 18-2 and newer. *NOTE: See additional information below. Additionally, StarFire iTC Receivers are no longer supported with software update 2017-1 and newer software. 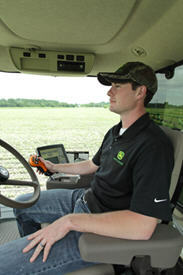 StarFire 6000 Receivers require software version 3.80F or higher when used with AutoTrac Implement Guidance. Gen 4 data is only compatible with the John Deere Operations Center. To use RDA on a Gen 4 CommandCenter Display with a GS3 2630 Display connected in the same machine, GS3 2630 software version 3.22.1095 (SU2014-1) or higher is required (for 4600 CommandCenter Display and 4640 Universal Display only). GreenStar Rate Controller Dry is supported with display software update 2017-2 and newer. The 4600 and 4200 CommandCenter Displays and 4640 and 4240 Universal Displays support documentation and section control of up to five GreenStar Rate Controller units. To update the GreenStar Rate Controller and GreenStar Rate Controller Dry, utilize a Gen 4 Display USB port. John Deere dealers can also utilize Service ADVISOR™. GDC 2.11A was the last software version available through Software Manager. GDC 2.20A has been available since spring 2015 and contains diagnostic language updates. This software can only be obtained through Service ADVISOR. The Gen 4 Displays and John Deere Rate Controller 2000 can support documentation and control up to five operations. ISO controllers such as SeedStar on John Deere planters can be used with a John Deere Rate Controller 2000 that is documenting additional operations. Additionally, Gen 4 Displays can document shared sections with a John Deere Rate Controller 2000. An example of this would be John Deere Rate Controller 2000 used with a Raven Sidekick™ ICD direct injection pump. For more information on Gen 4 displays and John Deere Rate Controller 2000 compatibility, please visit the John Deere Ag Sales Manual. AutoTrac Vision Guidance Camera 19-1 software 4.01L is only compatible with RowGuidance 3 Controller software AKK15783F and GreenStar 3 2630 17-1 software 3.34.1345 or newer and Generation 4 18-1 software 10.10.404-345 or newer. AutoTrac Universal 200, AutoTrac Universal 300, and AutoTrac Controllers are for use with the 4640 Universal Display and 4240 Universal Display. Please see the AutoTrac Universal 200, AutoTrac Universal 300, or AutoTrac Controller Sales Manual for exact model compatibility. Gen 4 Displays are compatible with one Agricultural Industry Electronics Foundation (AEF) certified ISOBUS implement; AEF-certified ISOBUS implements with Task Controller Section Control (TC-SC) functionality and AEF certification for TC-SC include sprayers, fertilizer spreaders, planters, seeders, manure applicators, etc. For third-party FMIS compatibility, reference the John Deere Operations Center. A software update performed by an authorized ISOBUS implement dealer may be required to obtain compatible software. ISOBUS implements must be certified through the Agricultural Industry Electronics Foundation (AEF) to be recognized by the Gen 4 CommandCenter display. Visit www.aef-online.org for more information; visit www.aef-isobus-database.org for an active list of compatible implements. ISOBUS implements with VT4 are now supported by Gen 4 Displays. Gen 4 Displays still support older VT versions (example: VT2 and VT3). If an implement is not loading after updating to Gen 4 software update 2017-2 (or newer on 4600 CommandCenter v2 processors), it is recommended that the implement manufacturer be contacted to get a software version that is either VT3 or VT4. When using an extended monitor with equipment visualized in ISOBUS VT Viewer and applying VT run page modules to two run pages shown at the same time, the extended monitor’s VT modules will not update. To mitigate this, only view VT modules on one run page at a time. For complete Connect Mobile compatibility, please reference Connect Mobile configurations. 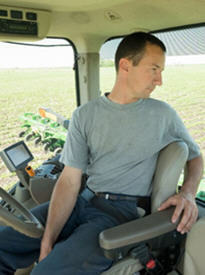 Implements without controllers can be documented as a stand-alone operation or with a rate controller from John Deere. Additionally, multiple implements without controllers cannot be documented together. AutoTrac Implement Guidance is compatible with SeedStar 3HP, SeedStar 2 and SeedStar XP. AutoTrac Implement Guidance is compatible with C850 Tow-Behind Air Carts with software update 18-2. AutoTrac Implement Guidance is not compatible with the SeedStar 4 HP planters for spring of 2019. NOTE: If instead an operator chooses to use the machine’s integrated IMS/iTEC functionality, then AutoTrac Turn Automation and iTEC must be turned off in the Gen 4 Universal Display. Voyager® cameras are supported on Gen 4 Displays. All other camera types are not supported. Gen 4 displays are not compatible with the DN345 Drawn Dry Spreader at this time. Gen 4 displays are not compatible with MCR. Gen 4 display work data is not compatible with and cannot be viewed in APEX software. USB files including pre-assigned APEX tasks and iTEC™ Pro sequences will not import into Gen 4 displays. NOTE: Gen 4 data is only compatible with the John Deere Operations Center. All Gen 4 activations are machine specific and cannot be transferred to a different machine. If not using WDT, an 8- to 32-GB USB is required to transfer data to and from the Gen 4 Display. Implement settings are display specific and cannot be imported or exported from the Gen 4 Display. RAM is a trademark of National Products Inc. Hagie is a trademark of Hagie Manufacturing Company, LLC and similar to John Deere branded equipment, John Deere will support Hagie equipment. Reichhardt is a trademark of Reichhardt GmbH Steuerungstechnik. Sidekick is a trademark of Raven Industries, Inc. Voyager is a trademark of ASA Electronics, LLC.